MYRTLE BEACH, SC – When Hurricane Florence hit South Carolina the wind and rain were expected, but it was the resulting flooding that created some of the worst damage the area has ever seen. A month after making landfall, an estimated 6,000 families in the Myrtle Beach area were still in need of help before the long, arduous recovery and healing process could begin. 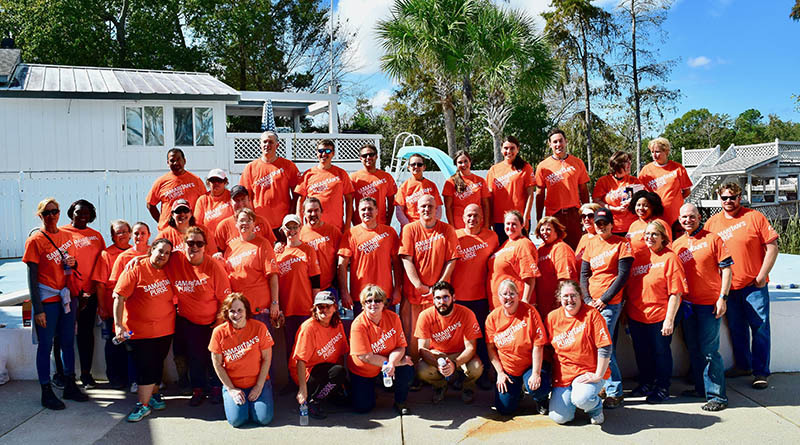 In order to help families in need, National Hospitality Group closed their corporate office on October 19th and more than 100 team members went to work to assist those affected by the storm. Collectively with Samaritan’s Purse a non-profit organization that provides volunteer relief in the wake of disasters around the world, the NHG team members pulled water logged insulation, ripped out water damaged drywall and cleaned up the families’ homes to prepare the houses for reconstruction. “While sometimes we can get caught up in the tunnel vision associated with work, it is important for us to support those that are in need. It is our hope that we can continue to reach out to the greater community and positively impact lives,” said Jason Shroff, CEO of National Hospitality Group. It is estimated that Hurricane Florence lead to more than thirteen billion dollars in damage and took the lives of 53 individuals, a loss that will take a long time to recover from and will live in the memories of residents for even longer. To donate to Samaritan’s Purse or another organization that is assisting with Hurricane Florence recovery visit their website Samaritianspurse.org or CharityNavigator.org which connects people to volunteer program. National Hospitality Group (“NHG”) is one of the largest managers and developers of North American vacation interval resorts. NHG provides its customers with tailored hospitality and vacation offerings. The organization is comprised of three renowned resort brands, Capital Resorts Group, Defender Resorts and SPM Resorts. NHG currently operates seventy-one resorts throughout the United States and Caribbean. You can learn more about National Hospitality Group and our resorts at NHGVacations.com.